The hackneyed story of an angry kid called Stet (Garrett Wareing) from literally the wrong side of the tracks who's dumped in an elite choir school by his philandering rich father and of course turns out to be a musical prodigy who defies his hard-ball music teacher (Dustin Hoffman) to become the star. It's the sort of movie that tells you a kid comes from a bad home by having his his mum literally wake up in front of a bottle of vodka, and literally has him throw rocks through a window. Dustin Hoffman portrays uptight harshness by walking out of every meeting and then giving the kid one of those "you don't want this" speeches at an elevated emotional pitch that comes out of nowhere. Naturally he is also hurting, because he wanted to be a concert pianist. Naturally, the two end up bonding and the choirmaster helps the kid overcome his stage fright. There are pompous speeches about the power of communal singing and affecting an audience and mistily filmed scenes of faux-English school buildings in the manner of DEAD POET'S SOCIETY. The evil nemesis (well, the cocky current choir-leader) even has a dodgy peroxide blonde dye job like Draco Malfoy. So it is clear than from a cinematic perspective there isn't much new or to like here. But the film isn't entirely unwatchable because it at least takes the movie takes music seriously, not least in being directed by Francois Giraud, who is also an opera director. And if you were in a serious choir at school, as I was, the familiarity of the rehearsals, the concerts, the repertoire will at least add a nostalgia factor. 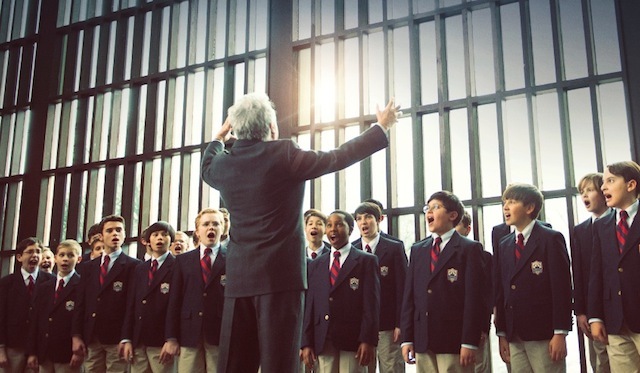 BOYCHOIR has a running time of 103 minutes and is rated . The film played Toronto 2014 and was released earlier this year in Singapore, Canada, the Netherlands, the USA, Croatia, Serbia, Portugal, Turkey, Kuwait, Israel and Greece. It is currently on release in the Philippines, the UK and Ireland. It opens in Hong Kong on September 3rd, in Germany on September 10th, in Japan on September 11th, and in Italy on December 3rd.